Looking back at the cover for Flash: The Fastest Man Alive #13, it wasn’t promising for Bart Allen, especially with the Flashes’ history of death. We know now that it ended badly for him (though he got better). Of course, there’s also a history of Flashes (and supporting cast) appearing dead on the cover, but still making it through. 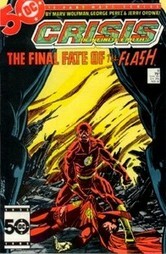 More than 25 examples of dead Flash covers appear below. I went through the galleries at the Grand Comic Database for the 1959 and 1987 series, and managed to find no less than 23 covers on which the Flash, or a member of his supporting cast was depicted as dead, but managed to survive the story. Sometimes the events took place, but the character survived, or it turned out the body was someone else’s. Sometimes they were what I call “CPR deaths,” in which the character is technically dead, but not beyond the help of modern (or in comics, slightly ahead of modern) medicine. Generally they’re resuscitated in the following issue. And some are just plain misleading. Hover for a description. Click to open the issue’s page at GCD. I later discovered that Comic Coverage did a similar feature on The Many Deaths of Barry Allen in 2006. Originally published at K-Squared Ramblings. I’ve added a couple of items since then. 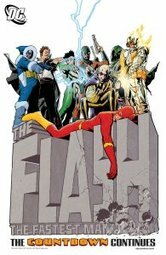 This entry was posted in Covers and tagged Barry Allen, Bart Allen, Black Flash, Bronze Age, Death, Repost, Silver Age, Wally West on September 23, 2009 by Kelson. 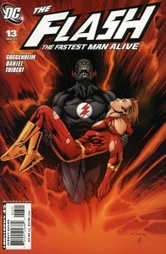 I’m partial to the v1 #243 cover, in which the Flash is holding the Top’s corpse by the groin. Just wrong. Oh, yeah, I should’ve included that one! great post! …though I can’t help but think that their are many more. Great continuation of what I started in 2006. I didn’t include anything from the Wally West years…and there are a shocking number of “Wally’s Dead” covers as well…not to mention Bart! What *is* is with the Flash family? .-= Mark Engblom’s latest blog post: Epilogue =-. Hey, did you ever get my crazy-long “Cover Homages” e-mail? Yes, I did…I’ve been meaning to get to them ever since, but I’ve just been really disorganized until I started to get things under control a little a few months ago. I’m sorry I haven’t gotten to them yet, but I’m hoping once my current project settles out a bit that I’ll have time to tackle the reference site again. Oh, I figured if you’d gotten it the problem was either the crazy amount of web design and comics news you were processing; I just figured that, with Speed Force launched and seemingly going swimmingly, if you’d lost it this might be a better time to re-send if necessary. Wasn’t there a Zero Hour issue with Wally’s mask being held up as if he was dead? Remember when we thought he would die in that series? I have no idea how I managed to include Flash #233 and #235 but not #234! As for the others…in most of them, someone actually died! .-= Robert’s latest blog post: High Five! Top Ten! – The Most Ridiculous Villains We Could Think Of =-.